Please choose size desired. Embroidery of Hebrew or English can be added for $15. Please put names in text entry box. 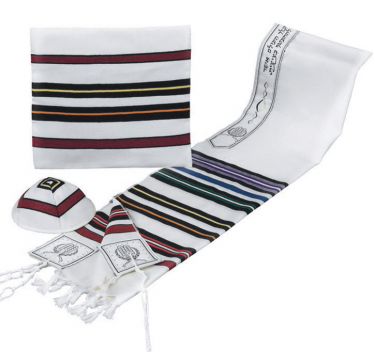 This beautiful colorful B'nai Or Tallis Set is symbolic to Joseph's multi-colored coat. Made in Israel, it has 13 different colors woven in the design. Tallit is a light wool and comes with a matching Tallit bag and kipah. B'nai Or Tallit sets have 13 different colors woven into the tallit. B'nai Or Tallit set includes tallit bag and kipah. Makes a wonderful set for anyone called to the Torah whether for a Bar Mitzvah or High Holidays. Please select your size desired. If embroidery of Hebrew or English name is desired it can be added for $15. Please write name in the text box at checkout.